What I love about being a teacher is that you get two new years every one year — August and January. 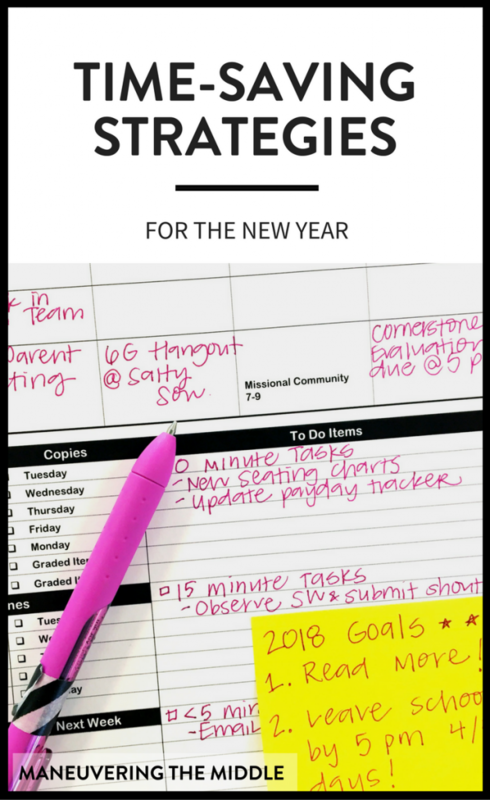 Since 2018 has just begun, I thought I would share some of my go-to time-saving tips so you can start your new year in your classroom as efficiently as possible. How many times have you looked at the clock during your planning period and realized that even though 20 minutes have passed, you have nothing to show for it? Do not start your planning period without a plan. When I write down a task, I write down how long I expect it to take. Only have ten minutes before your next meeting? Scan your to-do list and find a task that should require 10 or fewer minutes to complete. This will help you maximize those smaller chunks of time between commitments. This might be a no-brainer, but I fall into this trap all the time. I get to the copier, start the copies, and mindlessly stare at the copies being made like a zombie or pull up Instagram. Anyone else? My school requires that we stay with our copies until they are complete to take care of jams or refilling the paper. Make use of that time by bringing something along to complete. This is typically when I complete answer keys or email parents. Come back soon to read my post on student jobs, but for now, if what you are doing is something a student can do — updating trackers, cutting, laminating — then let a student do it. A great way to decide whether a job should be yours or should be given to a student is to ask yourself: In the time that I could explain how to do this and answer any questions, could I have finished it myself? This is a particular favorite of mine. Batch processing is grouping similar tasks that require similar thinking in order to streamline completion. Batch process grading — grade the same assignment across all class periods, and then enter all of them into your grade book. This is much more efficient than grading a first period’s assignments and then entering the grades into the grade book and then starting on second period’s assignments. It takes your brain time to refocus when switching from one activity to another activity. Saving time allows us to have the time and energy to devote to our students. Here’s to 2018! What are your time-saving tips? 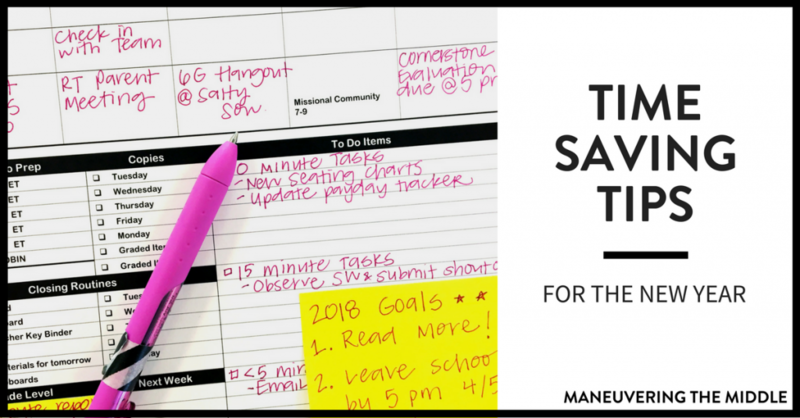 How are you going to save time in 2018?